We’ve all heard the saying… now you can play the game! The When Pigs Fly slot is one of the latest games from NetEnt, which in itself makes it worth closer inspection. It may look odd but that’s part of the fun, and the reels won’t act in the same way you would expect them to either. Ready to find out more? The When Pigs Fly NetEnt slot is a 5-reel slot with 20 paylines. It begins with five symbols on the centre reel, three on the second and fourth reels and one each on the two end reels. Yep, sounds confusing, but there is a great reason why this happens. NetEnt slots are generally very reliable in terms of gameplay. That’s definitely the case here, especially as they’ve put a different twist on things. The main onus is still very much on fun though, as you’ll see. The graphics are wonderful, featuring space pigs (oh yes!) and spaceships. You’ll find yourself smiling as you play this one, or at least we did! The game works on 45 ways to win initially, with the grid you see on your screen. While the appearance of the game may be a little confusing at first, you will soon get the hang of how it works, and how to unlock more winning ways. With no paylines in play, it all comes down to the ways-to-win feature. 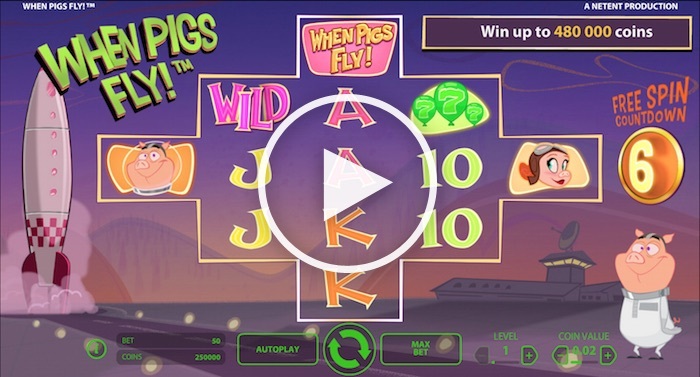 Much is revealed in the When Pigs Fly slot pay table. You can access this on the bottom-left of the screen (look for the green ‘i’ logo). The lower-paying symbols are the usual K, Q, J options, but there are higher-paying ones as well that are in keeping with the game theme. When Pigs Fly appears as a logo and can scoop 1,000 coins for five. You also have female and male space-bound pigs and a winged helmet, among other things. Incidentally, the second page of the five-page pay table reveals how the ways-to-win part of the game works. Right, here we go then. You start off with 45 ways to win, but this can be increased if you get a successful combination of symbols to spring a prize. This then adds a couple more squares to the reels. You also get a free re-spin at this point. Get another prize and two more squares are added, with another free re-spin. This carries on until you have had five re-spins – assuming you manage to get another winning combination after each one. So how do you get the 3,125 maximum ways to win then? 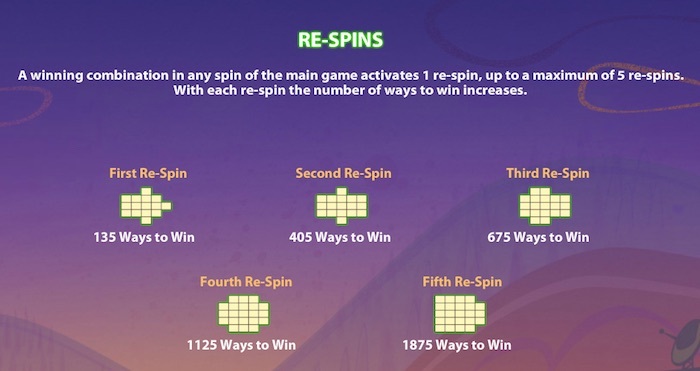 Well, once you have achieved five re-spins, you need to get another winning combo on that fifth one. If you manage to do this, you will get eight free spins. This opens up the reels to their fullest extent, triggering the 3,125 maximum ways to win. It’s a great feature and something that does set the game apart. If at any point you end up with a re-spin and you do not win a prize, the screen will revert to its starting position, which looks more like a diamond than anything else. Give it a try in demo mode so you can get a better feel for how the whole thing works. Oh, and by the way, there is also a wild that uses that exact word to make itself known. This can appear on any reel except the first one – both in the regular When Pigs Fly NetEnt slot game and in the free spins feature. There is no multiplier attached to it, but it does replace every single other symbol you will find in the game. The smallest bet you can make here is 50p – that’s a one penny coin on one level of the game. This provides you with 45 ways to win initially. Depending on what happens, you could go up to 3,125 ways to win. The biggest bet is achieved with a 20p coin value on 10 levels, which amounts to £100 for a spin. The game is generous in terms of the return-to-player percentage, which is set at 97%. What did you think of the When Pigs Fly slot? New NetEnt slots are always worth trying, but we did think this one had a lot of appeal. The cartoon appearance is a lot of fun, and who knows… it could make you smile in more ways than one if you win a bigger prize.